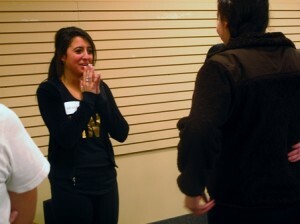 Participants on the left raised their arms when they felt that their personal space was being violated, indicating exactly where the barriers of their comfort zones lay. 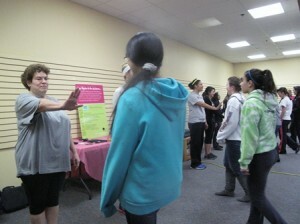 Westborough – On Jan. 4 and 5, women gathered in the event room at Tatnuck Bookseller to participate in “Empowering the Girls We Love: Personal Training 101,” a self-defense and safety training course offered through SAM Programs. Mike Kaselouskas prepares the girls for their next drill, a lesson on personal space and what to do if a perpetrator violates their comfort zones. 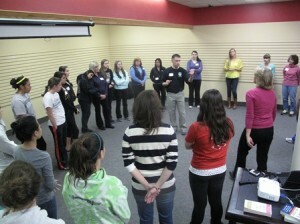 Participants and their partners practice drills that will help them in dangerous situations.